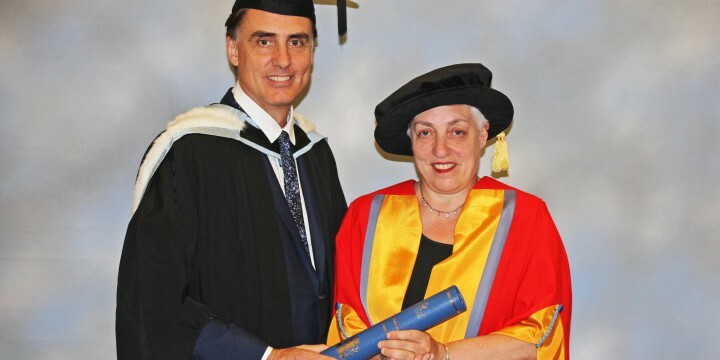 Ruth Mackenzie CBE, mastermind of the Cultural Olympiad for the London 2012 Olympic & Paralympic Games, has received an honorary fellowship from Queen Mary, University of London today (16 July). As Director of the Cultural Olympiad, Ruth Mackenzie was also curator of its finale, the London 2012 Festival – the largest ever UK-wide festival, with over 20 million attendances and more than 25,000 artists from all the countries participating in the Games. Ms Mackenzie has had an illustrious career in the arts and has held previous posts as General Director of Scottish Opera and Manchester International Festival, Artistic Director of Chichester Festival Theatre, Executive Director of Nottingham Playhouse and Consultant Dramaturg to the Vienna Festival. The fellowship has been awarded to Ms. Mackenzie, in recognition of the impact the Olympiad and Festival had on the east London community and also as an acknowledgement of her role as a supporter of Queen Mary’s Professor Paul Heritage, and the work of the People’s Palace Projects. People’s Palace Projects – an independent arts charity based at Queen Mary, which promotes the practice and understanding of art for social justice – curated a 30-day cultural event called Rio Occupation London which was saw 30 of Rio de Janeiro’s most vibrant artists take part in performances across the city during the London 2012 Festival.